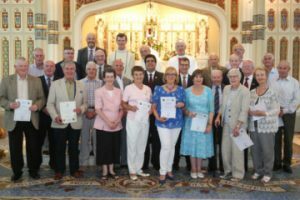 Ireland was recently honoured by a visit from the Society of St Vincent de Paul (SVP)’s International President. Renato Lima-de-Oliveira, from Brazil, visited four of the eight SVP Irish regions. He said that he was hugely impressed by the organisation and depth of work SVP carries out in Ireland. He added that he was charmed by the level of the warm Vincentian welcome he received. Kieran Stafford, the SVP National President in Ireland, formally welcomed Renato Lima-de-Oliveira and said that it was a sign of Ireland’s standing that the International President of an organisation with members in about 140 countries visited here so early in his 6-year term of office. On his first visit to Ireland since his election in June 2016, the International President travelled to the Midwest Region including Roscrea, Nenagh, Clonmel and Limerick. He also spent time in Dublin in the East Region, in Drogheda in the North East and Midlands Region, and in Newry and Belfast in the North Region. In Roscrea he attended an open meeting of the Conference, where he heard details of the work of assisting families and individuals in need. Local Church of Ireland Canon Jane Galbraith welcomed him to the town and spoke of her long association with SVP. Rev Tom Kingston, from the Methodist Church, was also present. In Nenagh Mr de Oliveira visited the Order Fulfilment Centre, which is the sorting depot for 20 Vincent’s shops in the Midwest Region. He then moved to the Regional Office in Ozanam House in Limerick, where he learned of the work carried out by SVP in the region. These include the drop-in service in Limerick city, social housing, two hostels for homeless men in Ennis and Limerick City, the work of Young SVP in the secondary schools and the region’s twinning arrangement with the SVP in Sierra Leone. In Clonmel he presented long-service medals to SVP members from the South Tipperary area. Kieran Stafford was present in what is his home town to welcome the International President. 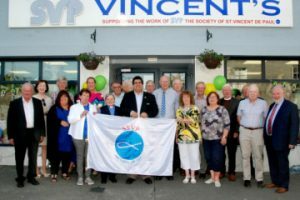 In Northern Ireland the International President visited the Vincent’s shop on Mill Street in Newry and the SVP drop-in Centre which supports homeless people and refugees. In Belfast his visit was celebrated with a Mass in St Malachy’s in Alfred Street. The Mass was concelebrated by Bishop Noel Treanor; Fr Perry Gildea, SVP Regional Spiritual Advisor; and Fr Michael McGinnity, Parish Priest of St. Malachy’s.